Cisco Catalyst 2950 series switches offer standalone, fixed configurations of managed 10/100 Mbps switches perfect for basic workgroup connectivity across your mid-sized or small network. All of the refurbished Cisco C2950 routers offered from Worldwide Supply come with Standard Image software functionality and Cisco’s ISO Software to support your voice, video and basic data services at the edge of any network. The Cisco Catalyst 2950 lineup of switches made its name through smart device management software and simple configuration through a web browser. You don’t need any extra terminals or special emulation programs to manage your network, and there are plenty of express setup options for controlling 12 to 48 switch ports. Depending on the size of your business, you’ll see a significant boost from any used Cisco C2950 switch, thanks to enhanced image software, security filtering at the network edge and superior redundancy for fault backup. 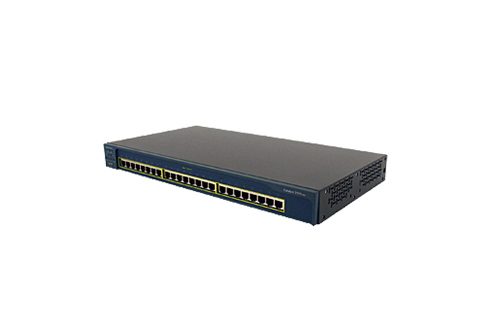 Worldwide Supply offers a wide selection of refurbished Cisco C2950 switches for growing small networks. We also buy your existing C2950s, allowing you to gain the capital you need to grow your network to a large enterprise scale. Turn extra assets or surplus into a new revenue stream and keep your business moving forward. We review all used Cisco C2950s and put them through a rigorous testing and recertification process so you can trust all of the refurbished equipment we provide. In addition, all used Cisco C2950 switches we sell come under a lifetime warranty, so you can feel confident that they’re as reliable as a new switch, but deliver significant cost savings.